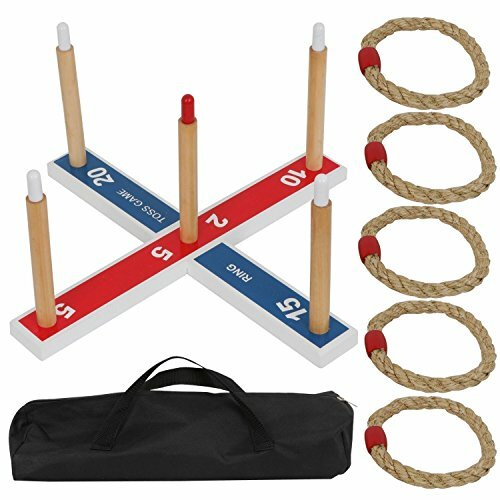 Fun kids games for the family: This ring toss game set includes 5 durable rope rings: a sturdy wood base and very convenient carry storage bag. - Kids games can help positively channel a child's physical and mental energies: game play can also help a child improve concentration skills and teach the importance of task completion: they can improve their own self esteem. - Group games help kids become more socially adept: not only do kids improve their interpersonal skills they learn valuable lessons about team spirit and healthy competition: a child can learn that it is healthy competition rather than winning that is most important. - Kids can improve eye-hand coordination as well as fine motor skills: and even facilitate the understanding of complex math equations. If you have any questions about this product by Patiojoy, contact us by completing and submitting the form below. If you are looking for a specif part number, please include it with your message.